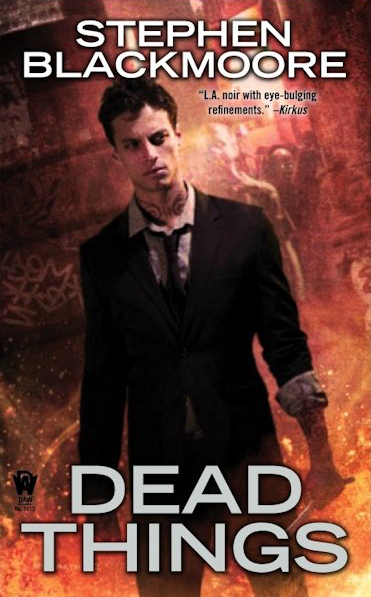 Dead Things by Stephen Blackmoore was recommended to me by an editor friend who not only reads my books, but also reads a lot of the same stuff I do. So I have her to thank for this one. After I saw the cover and read the description, I ordered the book immediately. I’d been aware of Blackmoore’s other book, City of the Lost, but seeing as how the Kindle version was pricier than the trade paperback edition, I let it pass even though it caught my eye. I’ve since rectified that and that book is waiting on my iPad as I write this. Blackmoore is a guy I’m gonna be reading. This book has an interesting premise, though by no means original. Which is fine. I enjoy the same kinds of things, as long as they don’t get repetitive. Eric Carter smacks me as a John Constantine riff (Hellblazer comics), and that’s also fine because I love Constantine when he’s on – although the comics have now since ended a 25-year run only to rebirth him as a kinder, gentler soul, maybe? Eric Carter, much as Constantine, is a man torn apart by his gifts and the choices he’s made in his life. Some fifteen years ago, after avenging his parents’ death, Carter left Los Angeles, never intending to return. He stayed alive using his wits and his powers as a necromancer, putting things back in the grave that inadvertently – or maliciously – wandered out of their coffins now and again. But Carter also speaks for the dead, taking vengeance on the living who preyed on others. The first-person narration is spot on for the character and the milieu, though the present tense does grate my nerves somewhat. I’ve read plenty of books of late that persist in present tense, but I just don’t care for the verb conjugation because they tend to call too much attention to themselves. Carter has the same kind of friends readers of these stories have seen before, the disenfranchised, people who no longer trust him, and those who will forever hate him for what he’s done. The author does a good job in establishing those, and does a good job of twisting and turning variations on a theme when he opens the doors to the various magical places tucked away in arcane corners of Los Angeles. Blackmoore’s love/hate relationship with the city is an added bonus to the story because he tucks in interesting tidbits of information and color to the tale. The plot is an old one: someone has killed Carter’s younger sister and he rides back to L. A. to seek revenge on a foe that he thought he’d already killed. Therefore we get Carter’s history while working our way through the adventure. It’s a nice setup that allows readers to explore the hero along the way. The plot is heavy on action, keeping the pace up and the pages turning. All through it, Blackmoore skill blends in color and backstory, adding layers to the layers till you can almost second-guess the moves he’s going to make. Of course, he’s expecting that too, and he stays just one step ahead of you. I also like the way Carter meets up with Santa Muerte and the twists and turns that relationship is obviously going to have. I’m looking forward to what the author has in store for his character and his readers. Whee! Agree with your thoughts on writing in present tense (I just keep wanting to “fix” some things! ), and the similarities and strengths in the genre. Did you ever try Cameron Haley’s MOB RULES? I did two books and novella with him, and it has the same kind of feel and setting. I’ll look out for the next for sure, though! I’ve got the first one on the iPad. You and I talked about that one at one time. Just haven’t gotten to it yet. As you know, I stay busy, but I’m moving that one up! This entry was posted on February 24, 2013 at 4:22 pm and filed under Adventure,Crime,detective,fantasy,Mystery,Noir,Outstanding New Writers,Paranormal,Urban Fantasy. You can follow any responses to this entry through the RSS feed. You can leave a response, or trackback from your own site.